Myles the hovercraft pilot, who offers tours of Broome’s Roebuck Bay in a banana-hued vehicle, walks over the rust-red rocks and stands in a dinosaur print. My two children, my husband and I, and a group of other keen nature lovers, stare in awe at the enormity of the impression. Myles explains that we’re looking at a 120-million-year-old footprint left behind by a sauropod, a four-legged herbivorous dinosaur. We learn that it’s not just the sauropod that roamed this region – the only traces of stegosauruses in Australia are found near here too. When confronted by the extraordinary footprints around Broome, University of Queensland palaeontologist Dr Steve Salisbury declared the area “Australia’s own Jurassic Park”. Here, 2,400 kilometres north of Perth, you feel as though you’re wandering around in one giant open-air museum. My mind is already turning circles, and then we move on to discussing the myriad creatures that live in the milky turquoise waters of Roebuck Bay, an area eight times the size of Sydney Harbour. Here you can spot saltwater crocs, dugongs chewing on seagrass and cute snubfin dolphins, a species so rare that Sir David Attenborough’s film crew flew in for a month to film its habitat and movements. After several more hours exploring the bay from above, on the doorstep of Broome, we head home for peaceful night’s sleep in our tropical-style lodgings at BroomeTown B&B. The breezy holiday home with an inviting pool is located only a 10-minute walk from Chinatown, Broome’s shopping hub, and next to the Broome Courthouse, where colourful markets are held every Saturday and Sunday. We’re up with the birds to take a walking tour with Bart Pigram of Narlijia Experiences Broome. Bart, a Yawuru man, takes us on a two-hour adventure through the heart of Chinatown, which was established by Chinese merchants in the late 1800s. Along the way he describes the landscape and the Yawuru people’s place within it, and weaves in stories about Sun Pictures (the oldest operating outdoor cinema in the world) and the opium dens, brothels and gambling houses that once existed in Broome. Like 90 per cent of Broome locals, Bart’s background is a melting pot of Indigenous, European and Asian heritage. Many people here are descendants of the Japanese, Chinese, Malaysians and Filipinos who came to seek their fortunes or work as pearl divers. 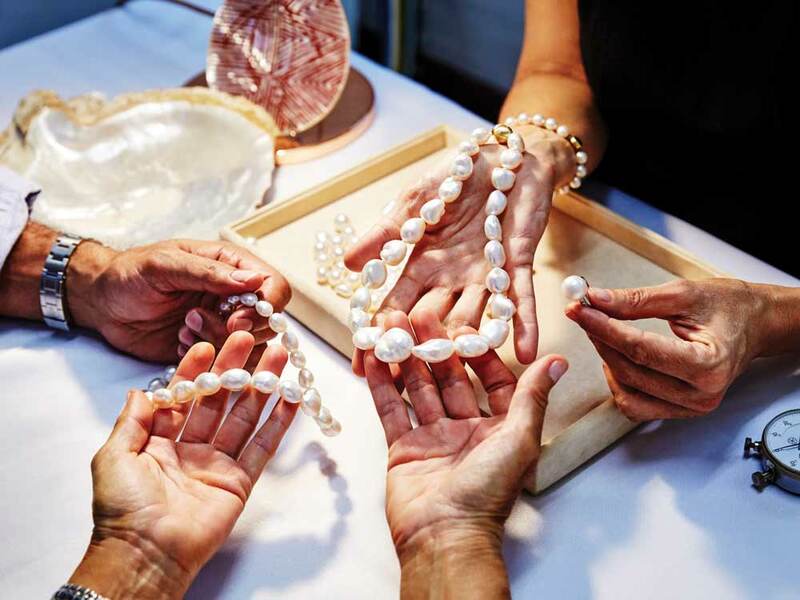 Chinatown, seven kilometres from Cable Beach, is a legacy of the industry’s boom days before the market collapsed, eventually replaced by the new trade in cultured pearls. After bidding Bart a fond farewell, we drive 20 kilometres east of Broome to one of Australia’s birding hot spots, the Broome Bird Observatory. This observatory has the uncanny ability to turn the most disinterested of birdwatchers into a twitcher. Who could not be in awe of the estimated 150,000 birds who visit Roebuck Bay’s mangrove-dotted shoreline every year? We may think we have travelled far to get to Broome, but that’s nothing compared to the eastern curlew. This elegant brown shorebird has flown 17,500 kilometres to get here from its breeding grounds near Vladivostok in Russia. The eastern observatory has rustic-style accommodation and week-long courses. 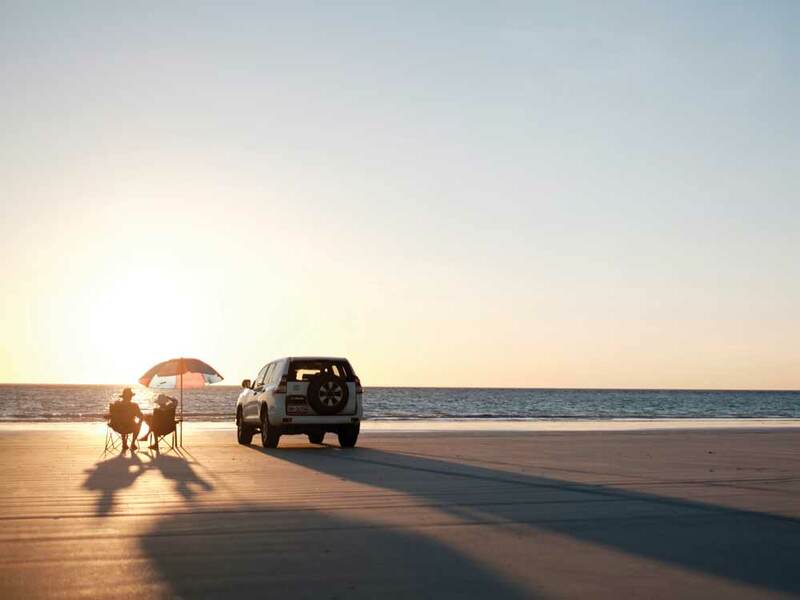 We would love to stay – but with so much still to see in Broome, we jump in the car and journey back. We head to Cable Beach, where there’s a dizzying array of activities on offer. Come sunset we find ourselves sipping cocktails at a beachside bar, while watching the locals drive their 4WDs onto the 22-kilometre strip of white sand for a barbecue. Later that night we watch one of the best free shows in town, known as ’Staircase to the Moon’ (the astounding phenomenon occurs only on certain nights between March and October, so be sure to check the Broome Visitor Information Centre website for dates). The golden glow of the full moon on the tidal flats creates the illusion of an enormous staircase. The best place to witness this natural phenomenon is at Town Beach, where there’s an open-air market with stalls, live music and food trucks that dish up authentic Asian street food. Speaking of dinner, it’s tricky deciding where to dine in this lively town. Recommendations include Zensai, a romantic Japanese restaurant located inside the Cable Beach Club Resort, The Aarli in Chinatown and Bali Hai Resort at Cable Beach. We opt for a casual meal at the Mangrove Hotel, with its spine-tingling view across beautiful Roebuck Bay. We speak with Darwin Ccup ambassador Brooke Prince to uncover just what it is about this month-long racing carnival that makes it such a standout.